1819 թվականին Ֆ. Օսաննը, ուսումնասիրելով Պլավտոսի կատակերգության 15-րդ դարի ձեռագիրը, հայտնաբերեց Ալեքսանդրիայի գրադարանի մասին տեղեկություններ պարունակող լատինական մեկնաբանություններ, բայց դրանք հրապարակվեցին ավելի ուշ: Բովանդակությունը հետևյալն է. 13-րդ դարի սիրիացի եպիսկոպոս Գրիգորիոս Բար-Էբրեյի Chronicon Syriacum աշխատության մեջ հայտնում է, որ փրկված ձեռագրերը ոչնչացվել են 7-13-րդ դարերում՝ արաբ-մուսուլմանների տիրապետության ժամանակաշրջանում, բայց այս փաստը վկայող հավաստի տեղեկություններ չկան։ Հանարաճանաչ է այս պատումը. 641 թվականին խալիֆ Օմար իբն Խատտաբը հրաման տվեց իր սպարապետ Ամր իբն ալ-Ասին այրել Ալեքսանդիայի գրադարանը՝ ասելով. Ռուս պատմաբան-արաբագետ Վ. Բոլշակովը դա մեկնաբանում է այսպես. Браво Б., Випшицкая-Браво Е. Судьбы античной литературы // Античные писатели. Словарь. — СПб. : Лань, 1999. — С. 7-20. ↑ 1,0 1,1 The Shores of the Cosmic Ocean — 1980. ↑ Rudolf Blum. Kallimachos. 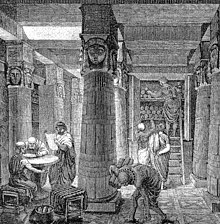 The Alexandrian Library and the Origins of Bibliography. — University of Wisconsin Press, 1991. — P. 104-105. ↑ Ioannis Tzetzae scholiorum in Aristophanem Prolegomena // Rheinisches Museum. — № VI. — Էջ 108. ↑ 21,0 21,1 Roger S. Bagnall Alexandria. Library of Dreams. — 2002. — P. 359. ↑ Roger S. Bagnall Alexandria. Library of Dreams. — 2002. — P. 357. ↑ Heinz-Günther Nesselrath Das Museion und die Große Bibliothek von Alexandria. — 2013. — S. 86-88. ↑ Большаков В. О. История Халифата. — М.: Вост. лит., 2000. — Т. 2. — С. 122. ↑ Ritschl F. Die alexandrinischen Bibliotheken. - Breslau, 1838. ↑ Steve Berry. The Alexandria link: a novel. - New York, 2007. ↑ Clive Cussler. Treasure: a novel. - New York, 1988. ↑ Denis Guedj. Les Cheveux de Bérénice. - Paris, 2003. ↑ Jean-Pierre Luminet. 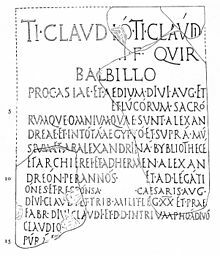 Le Bâton d’Euclide: le roman de la bibliothèque d’Alexandrie. - Paris, 2002.